At ease within the graceful confines of a 95-year-old building with spectacular red marble pillars, mosaic floors, ornate arches, and classical sculpture, the president of the Maryland Institute, College of Art (MICA) might easily be mistaken for an art historian or museum curator. But Fred Lazarus IV (MBA '66), who has led this august institution for the last twenty years, is neither. In fact, Lazarus claims no formal artistic training beyond auditing a single art history class in college. "When they interviewed me for the president's position here, a faculty member asked me what work of art in the Fogg Museum was my favorite," Lazarus recalls with a grin. "I dodged the question." He acknowledges that his lack of artistic background may seem unusual, especially in light of the fact that he is the first nonartist to hold the office of president in MICA's history. "When they offered me the job, I thought they were crazy," he says. "Not only was I not an artist, I had no real experience as an educator either. To this day, I have no idea how they got it past the faculty!" Getting to MICA, a 172-year-old Baltimore institution, was one in a string of happy "accidents of fate," as Lazarus puts it, that have characterized his career. He enrolled at HBS directly out of Claremont McKenna College in Claremont, California, with plans of going into retailing. "Business school convinced me that retailing was not what I wanted to do," Lazarus says. Instead, moved by the political tenor of the 1960s, he felt himself drawn toward nonprofit activities. Upon graduating from HBS, Lazarus took the advice of a classmate and joined the Peace Corps in Panama, where he worked to develop a business training and education program at a Catholic university. His return to the United States came on the heels of the assassinations of Martin Luther King, Jr., and Robert F. Kennedy. These events heightened his concern and commitment to help find solutions to the troubles of urban areas. In 1969, he joined the staff of the National Council for Equal Business Opportunity, working in urban areas such as San Antonio and Chicago to help develop for-profit community organizations. Two years later Lazarus became president of the Washington Council for Equal Business Opportunity. Eventually he left that job, because, he says, "I thought it was important that those local organizations be run by members of their own communities." In the mid-1970s, Lazarus was looking for a position in government and having a hard time finding one that would give him the broad experience he was seeking. By chance, he ran into Nancy Hanks - then chair of the National Endowment for the Arts - at the opening of the Hirshhorn Museum in Washington, D.C. "Out of nowhere, Nancy came up to me and said, 'I hear you're looking for a job - why haven't you called me?' " A few weeks later, Lazarus was ensconced as senior staff assistant to the chair at the NEA, a position he sees as a major turning point in his career. "It was a fabulous experience. It was there that I became interested in the education of the artist." Under Lazarus's leadership these past twenty years, MICA's operating budget has increased eight times, its endowment has grown over twentyfold, and its campus has expanded dramatically. When Hanks's term at the NEA ended, Lazarus moved on to MICA, which was then struggling for both credibility and survival. "Those were difficult times," recalls Lazarus. "We were operating under a deficit, our endowment was quite small, we were accepting almost anyone who applied, all the buildings needed renovation, and the faculty was on the verge of unionizing. It was not a happy place." But Lazarus realized that MICA wasn't just a school - it was a business, where one could apply business concepts such as fiscal management and marketing strategies. However, he also had to remember that a nonprofit was a very different kind of operation from most for-profits. "You have to be very sensitive to your constituencies," he explains, "and we have many constituencies here: the alumni, the faculty, the students, the board, and the community. In this setting, we move forward by building consensus." Under Lazarus's leadership MICA has grown tremendously. Financially, the school's operating budget has increased to eight times its 1978 level, and its endowment has grown over twentyfold. Physically, MICA has dramatically expanded its campus, acquiring new buildings and renovating old ones. But perhaps most impressive is the growth of the school's programs and its reputation. MICA has developed into a major national and international art school. While in 1978 75 percent of the student body hailed from the Baltimore area, today 80 percent come from 45 states and 38 foreign countries, with only 20 percent from Maryland. Lazarus beams when he talks about MICA's students: "They have led this institution as much as the faculty and the administration. The challenge is in keeping up with them." In addition to leading MICA through a period of growth and success, Lazarus has played a significant role in the Baltimore community. He is a director of numerous local organizations involved in the arts, education, and urban development. "Playing an active role in a relatively small city and a relatively small state, you get to know the mayor and the governor, and you can actually make things happen," Lazarus says. Wherever possible, he tries to point community resources and activities toward urban growth, integration, and the creation of opportunities for minorities. On a national level, Lazarus is chairman of the board of Americans for the Arts. "I've long been frustrated by a national lack of understanding and appreciation for the arts," he observes. "Being close to the artistic hubs of Washington and New York, I'm in a good position to be active in those areas." After twenty years of leading MICA, Lazarus says he "can't imagine liking a job more." Showing no signs of slowing down, he continues to lay out ambitious, long-term plans for the school. "I often think of the words of Chuck Close, an artist who spoke at MICA's commencement last year," Lazarus recounts. "While he was recovering from a stroke in the hospital all he wanted to do was paint. He told us, 'You don't realize how lucky you are that you can work seven days a week doing what you love.' 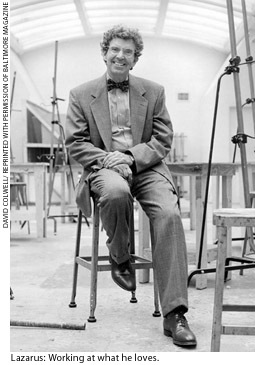 "
Fred Lazarus delivered the following remarks to the policy board of Americans for the Arts in Washington, D.C., in March 1998. The federal government has provided support for the arts in this country in many ways over the past two centuries, but it is only since the creation of the National Endowment for the Arts in the mid-1960s that there has been a federal agency with the specific charge of promoting the arts. In the 35 years since the founding of the Endowment, the state of the arts has changed dramatically. The arts are stronger, more available, and more accessible in large part due to the efforts of the NEA. The connection between the arts and other aspects of society is greater than ever. If federal support for the arts is going to continue, it must first and foremost support public purposes. The federal role is to carry out initiatives and programs that foster public purposes through the arts - purposes that cannot be more effectively addressed at the state or local level. Developing research about the state of the arts in this country.